It’s that wonderful time time of year when we start to write out our gift lists, plan our festive timetable and remember how many relatives we must buy for this Christmas. Looking for the perfect sleigh in which to transport all those presents you buy? The industry-leading 448-litres of boot space in the brand-new MG ZS makes it the perfect helper this Christmas. Top it off with a 7 year warranty, three steering modes and top spec infotainment system, and you’ve got an ideal festive chariot. The UK’s third largest shopping centre must be on your wishlist if you’re planning on heading to England’s capital for a spot of shopping. Although there are bigger shopping centres, this is the UK’s busiest, with more than 43 million visitors every year. With its central location and high number of shoppers, you may find yourself queuing to get in and squeezing into a parking space. 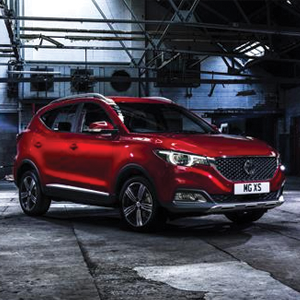 However, fear not, the Urban steering mode on the MG ZS is engineered to offer a lighter and quicker response at low speeds, making Westfield’s car park a hassle-free experience. The Bull Ring Shopping Centre is a great shopping destination, with 140 stores, including a large Selfridges but, extra fun comes from its proximity to one of the UK’s best Christmas markets. Again, the Urban steering mode comes into its own here, meaning you can park up and enjoy your shopping day and Christmas festivities well into the evening. If large shopping malls aren’t your thing, why not make a visit to the Shambles in York? With buildings more than 500 years old, it’s one of the most historic shopping streets in Britain and bound to look beautiful at Christmas. For the country roads that surround York, the Dynamic steering mode is a good bet. Designed to increase the steering effort, deliver a higher damping effect and increase the centre definition at medium and high vehicle speeds, you can really make the most of the winding country roads. For those that have designer brands in mind, Bicester Village is a fantastic option if you also like to bag a bargain to boot. One of the biggest bonuses of shopping here is that parking is free, so there’s no need to worry about planning that into your shopping budget. Unless you’re local to the village, getting there will likely see you tackling multiple driving conditions from motorways to residential streets. With this in mind, the Normal steering mode on the MG ZS is ideal, as it gives you a consistent ride regardless of the terrain. Built with the ambition of making Cardiff a leading European retail destination, the newly-refurbished shopping centre has been designed with enough cafes and shops to satisfy any 21st century shopper.One of the largestshopping centres in the country, St David’s represents 39% of the total retail floor space in the Cardiff – equivalent to 30 football pitches of shopping! Attracting more than 38 million visitors a year, MG’s first retail store Nathaniel MG Cardiff is based here offeringa dynamic, immersive and modern retail experience for customers.